Clouds have evolved as the next-generation platform that facilitates creation of wide-area on-demand renting of computing or storage services for hosting application services that experience highly variable workloads and requires high availability and performance. Interconnecting Cloud computing system components (servers, virtual machines (VMs), application services) through peer-to-peer routing and information dissemination structure are essential to avoid the problems of provisioning efficiency bottleneck and single point of failure that are predominantly associated with traditional centralized or hierarchical approaches. These limitations can be overcome by connecting Cloud system components using a structured peer-to-peer network model (such as distributed hash tables (DHTs)). DHTs offer deterministic information/query routing and discovery with close to logarithmic bounds as regards network message complexity. By maintaining a small routing state of O (log n) per VM, a DHT structure can guarantee deterministic look-ups in a completely decentralized and distributed manner. 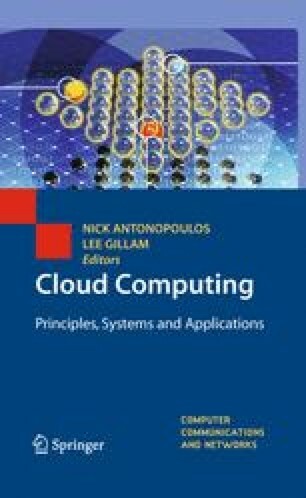 This chapter presents: (i) a layered peer-to-peer Cloud provisioning architecture; (ii) a summary of the current state-of-the-art in Cloud provisioning with particular emphasis on service discovery and load-balancing; (iii) a classification of the existing peer-to-peer network management model with focus on extending the DHTs for indexing and managing complex provisioning information; and (iv) the design and implementation of novel, extensible software fabric (Cloud peer) that combines public/private clouds, overlay networking, and structured peer-to-peer indexing techniques for supporting scalable and self-managing service discovery and load-balancing in Cloud computing environments. Finally, an experimental evaluation is presented that demonstrates the feasibility of building next-generation Cloud provisioning systems based on peer-to-peer network management and information dissemination models. The experimental test-bed has been deployed on a public cloud computing platform, Amazon EC2, which demonstrates the effectiveness of the proposed peer-to-peer Cloud provisioning software fabric.